A new year - A new beginning. The first time I met David Kersh I was struck by his sincerity, dedication and passion for what he was doing. I was also impressed by his humility and wondered, at the time, if his "aw shucks, Ma'am" persona wasn't just a clever act. After all, how could anyone that talented, that handsome, that personable; be so humble and unaffected? There are a lot of things about this artist that sets him apart from his peers but the one I find most fascinating is his unique career stability. In our very first interview when I asked him what his primary career goal was, without hesitation he replied, "Longevity." In an industry where career length sometimes seems to be determined by a random spin on a phantom wheel of fortune, Kersh appears to be extremely fortunate. Despite health problems that prevented him from touring or performing for almost three years, he has been able to sustain his career. Last year he picked up where he left off in pursuit of career longevity, as a member of the Honky Tonk Tailgate Party (with Rhett Akins, Chad Brock, and Daryle Singletary). Kersh sees his ongoing popularity as "nothing less than a true blessing." He credits his fans, a label who has consistently believed in him (Curb Records), and the radio stations that have kept playing his songs, for his ongoing success. He feels genuinely fortunate to be the recipient of such loyalty and he says that his relationship with his fans "is definitely a symbiotic one." When I asked how he likes touring with an ensemble of three other entertainers, he responded, "I am having the time of my life and I don't know why more artists aren't touring this way. This type of concert is as much fun for the artists as it is the audience and I think the variety it delivers is a real plus. You have ninety minutes of diverse, non-stop, high energy entertainment without putting a strain on any one performer." Their faces personify the ongoing love affair that David Kersh has with his audiences. As I look around the venue I see that every woman and man is displaying respectful restraint, silently lip syncing what has become his signature song, "Goodnight Sweetheart", eyes locked on David; mesmerized. This is a song from the heart and Kersh has perfected the art of speaking from his heart to the hearts of his listeners. When I asked about the acting ambitions that Kersh had expressed a few years back, he replied, "I wouldn't turn down an acting job if it were offered but it is not something that I'm aggressively pursuing. I'm having a great time doing what I'm doing and being unable to tour or record has given me more time to do some extra songwriting. I've written quite a few songs," he continued "and I think a few of them have a good chance of making the cut for my new album." At this point, he quoted some of the lyrics and then treated me to an impromptu a cappella chorus of one of the songs he has been working on. Let me go on record right now and predict that if this song does, in fact, make his new album; it will quickly become the number one song played during all future marriage proposals. Last year Kersh joined the National Advisory Council for the Make-A-Wish Foundation. He said that being able to facilitate a child's wish is definitely one of the greatest joys he has ever experienced. "Every time someone from the foundation says, 'Thank you,' I can't help but thinking that I'm the one that should be saying thank you to them for letting me be a part of something so personally gratifying," he said. Kersh is also a member of "Cowboys for Children" which focuses on the needs and organizations that benefit ALL children. His experiences with children from that foundation inspired him to write the song "When I Look At You." The powerful lyrics of the song reflect not only the impact that meeting these children had on Kersh, but also the incredible bravery of the children. The first chorus goes, "I've always tried to be the kind of man / that a child could look up to / but I find myself standing here / lookin' up to you." This is a really beautiful song and in exchange for a minimum donation of only $2.00, you can download the song from the www.cowboysforchildren.com website. One hundred percent of your donation will benefit the CASA (Court Appointed Special Advocates) agency in YOUR own community so if you do download the song, I would certainly encourage you to donate more than the minimum. When David Kersh is onstage, it is an emotional commitment from both sides of the stage lights. You are drawn into his performance like a moth to a flame. You walk away after the last encore feeling like you just survived a free-fall without a parachute! After following his career for several years, it isn't difficult to understand why his fans have remained loyal, his label has never wavered and radio has continued to play his songs. "Being a celebrity is heady stuff," Kersh told me, "It is easy to get caught up in it and you can lose yourself somewhere inside the fame. If you don't have a solid foundation and strong support from the people around you," he continues, "you can lose sight of the real world and forget who you really are." David Kersh speaks from his heart and from his personal experience. He has run the celebrity gauntlet, survived the sophomore jinx, roped in his ego and remains true to his Humble (Texas) beginnings. The rest is a no-brainer; he really is that talented, that handsome and that personable. 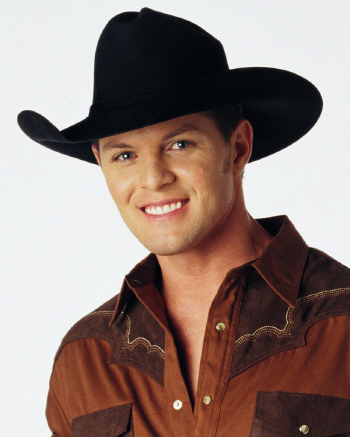 Between 1996 and 2005 David Kersh definitely earned the loyalty of country music fans. His first album, Goodnight Sweetheart, was released in 1996 and produced four singles on the Billboard Hot Country Singles & Tracks charts. A second album, titled If I Never Stop Loving You, was released a year later, producing three additional chart singles. His career was definitely a successful one then in 2005 a letter to his fans, signed by Kersh, appeared on his website saying his, "heart is just not in the music business anymore." And just as quickly as he had first appeared, he disappeared. I did manage to catch up with him, online, one day. We texted for a while and I finally asked the obvious question, if he regretted quitting the music business. "Nope! Sure don't," was his quick response, and I believe him since he is now happily married and back on a ranch where his roots had remained.